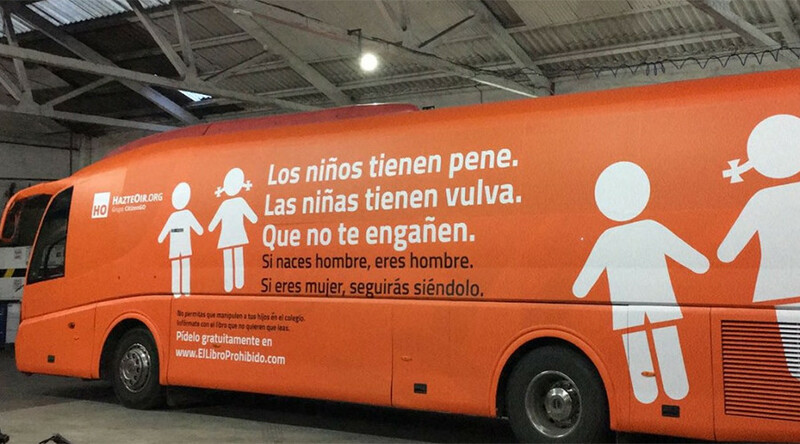 A controversial, bright orange bus emblazoned with a transphobic message, is preparing for a nationwide tour, and has reignited fierce debate over transgender and transsexual rights in Spain. The vehicle has been dubbed as ‘The bus of hate,’ according to La Vanguardia. Madrid’s City Council has promised to take the “appropriate measures” necessary to stop the bus from touring the city saying the vehicle does not comply with local council publicity and traffic ordinances. The bus belongs to the ultra-conservative, Catholic organization known as Hazte Oír or “Make yourself heard,” who are decrying any possible block of the planned tour, saying a ban would impinge on their right to protest against “sexual indoctrination laws,” according to the group’s president Ignacio Arsuaga, as cited by La Vanguardia. The bus is allegedly a response to posters displayed across northern Spain in Bilbao, San Sebastián, Vitoria and Pamplona by a group called Chrysallis Euskal Herria, an advocacy group for transgender and transexual rights. “There are girls with penises and boys with vulvas. It’s as simple as that,” the equally controversial posters read. “The efforts of many autonomous communities towards guaranteeing and protecting the rights of sexual and gender diversity in their legislation, educational protocols and healthcare [are to be commended]," Mar Cambrollé, president of the Platform for Trans Rights, told Hoy. "Such actions do not correspond with these repugnant acts of hatred and phobia towards transsexual people." The activist also underlined the high rate of suicide among the trans community which can be as high as 42 percent. The bus is scheduled to begin its nationwide city tour of Valencia, Barcelona, Zaragoza, Pamplona, San Sebastián, Bilbao and Vitoria in the coming weeks. Online response to the bus has been one of derision and ridicule with memes galore, the vast majority of which took aim at the Catholic church and ultra orthodox Catholicism in general.